This one’s been done for quite some time, and in fact has been living with Laurie for several weeks now. It was hard to give this one up, though I’m happy because I think I can say that she loves it just as much as I do. Remember these fun fabrics? They’re part of Laurie’s new Modern Whimsy line – so perfectly spring-y, especially in the Park colorway, which is shown here. 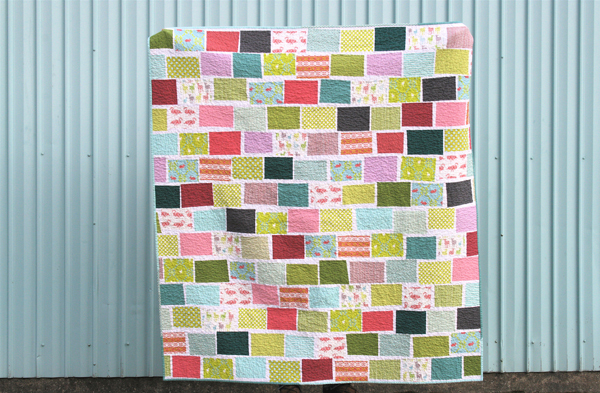 The design for this quilt was actually inspired by a pillow I saw several months ago in a Crate & Barrel catalog. I was immediately drawn to the simple rectangle shapes, made extra special by the way they were all angled differently. I thought something similar would be just perfect to show off Laurie’s designs. I really love the slight wonky aspect of this quilt. It has a bit of a brick pattern, but the addition of the thin white and the wonkiness really makes me happy. The blocks on the C&B inspiration pillow are appliqued, which I knew I did not want (trust me when I tell you that applique is not my forte! 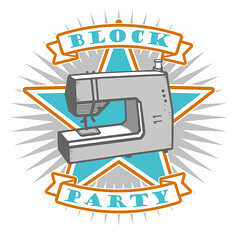 ), so instead I added thin strips of white to the blocks and then added the wonkiness when I trimmed them down to size. I’m very happy with the final pieced look, even though it took some time to get it all right! The backing is primarily Kona Coal, with a little extra purple and a couple tiny scraps of Laurie’s fabrics I had left over. The binding is pieced out of a few of the turquoise solids and prints I had left. Laurie’s shop is currently on vacation mode, but she’s due back soon in case you want to order any of these fabrics. In light of the recent fading experienced with one of Heather Ross’s fabrics printed by Spoonflower, a few of you have asked me what I’ve experienced with Laurie’s fabrics. I’ve made two quilts with her fabrics now and I’ve washed each of them only once before mailing them off to her. I did experience some slight fading, but it was in line with what I expected to see. Based on the way the fabrics are printed, I knew that they wouldn’t wash and wear in the same way I’m used to with commercially produced fabrics. In my mind, I’m ok with a little fading if it means I can get some fabulously unique fabrics like these. It is something to consider though, and if you’re interested, there’s a great thread about this fading issue, including some information straight from Stephen and Kim at Spoonflower about the printing process and what to expect in terms of fading. Speaking of Laurie and her unique fabrics… you might recall that she had a line picked up by Robert Kaufman called Tufted Tweets and it will be out this Spring. Laurie’s posted the first photos of the new line over on her blog, and can I just say WOW! I’ve been waiting to see the line, and it certainly did not disappoint! That orchid… all mine! I’m picturing not only one or more purple quilts, but also curtains, pillows, and I’ll probably have to copy Laurie’s idea for some PJ pants! I’m anxiously patiently waiting until I can see it in person! 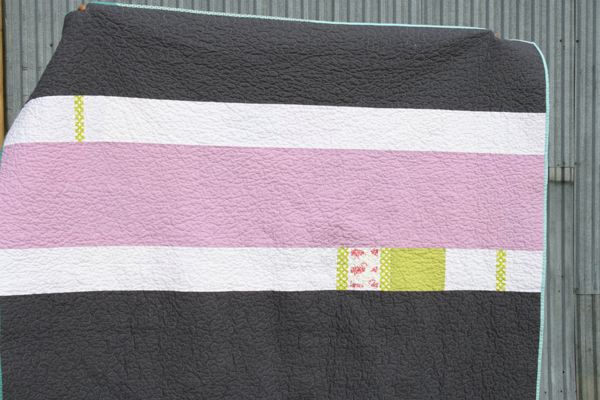 This entry was posted in [search] Wonky/Improv Quilts, 2010 Finished Quilts, Finished Quilts, Posts about Quilts, Quilts and tagged brick, handmade, lap quilt, laurie wisbrun, modern, modern whimsy, quilt, quilting, rectangles, scarlet fig. Bookmark the permalink. 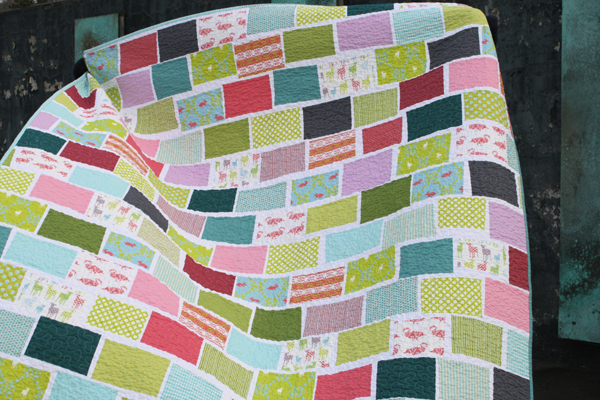 what to do when you love a quilt? OK, I love all your quilts, but this one may be my favorite. I love the sweet wonky simplicity. LIke each little print is so excited to be seen and admired. It is just so wonderful! And I am also so very happy for Laurie. I have long been a fan of her sofas and chairs. Looks like she will have some small prints too! Awesome. LOVE the quilt, another to add to my every growing to-do list. Ashley: I just adore, adore, adore my new quilt. It’s been on my couch since the very moment it arrived here in Austin. I have a sick kitty who just loves it too. It’s bringing her lots of comfort and I’m so thankful she has it to cuddle up on. Thanks as always for a design that really brings out the very best in my patterns. I can hardly wait to see what you might create with Tufted Tweets! I LOVE THIS one!!! All the solids make it especially wonderful!! This is my favourite too! It combines all my favourite patchwork ideas. Love it. I like the quilt; another great one. 🙂 And the fabric is really lovely; it warrants a look-see. oh man….I LOVE this! I don’t know that I would have the patience to do it wonky, though! I Love it! I is just so cool. That is a fabulous quilt. Just the perfect amount of wonkiness. Hi, I love this. Can you do a tutorial? Or tell me the dimensions of the rectangles? did anyone find dimensions or instructions? i would love to make this quilt. What a beautiful quilt! I love the fabrics and the slight wonkiness. Ooh…I love the wonky brick look! Love this one. Just. Love. It. Ashley….the quilt is gorgeous!! I agree that those are some great fabrics, and the brick pattern shows them off perfectly!! Ashley this is beautiful. I think one of my favorites!! Are the rectangles wonky too or just the white strips in between them???? I too did some hexagons and am also completely addicted! Thanks as always for your wonderful inspiration. Your stuff is always amazing but this is by far my fav! I’d love more scoop on how you achieved the wonkiness b/c I cannot work that out in my head. I love this quilt too !! I have some of Laurie’s fabric waiting for the perfect idea . It will be hard to top this . This quilt is an absolute delight. It looks like it would have taken some time to get the wonky look right, but so worth it. You’re right about the fabric. I’m working with the donkey and boots fabric and have experienced some slight fading, but its pretty good. I love Laurie’s fabrics too. This is beautiful! The fabrics are great and I especially love the pattern. I’ve been thinking about a brick pattern quilt myself and so I really really love this! I love this one! I adore those fabric colors, and I especially love the wonky brick path pattern. It looks exactly like a brick path. I would love to make a quilt using this technique. Very pretty. Glad it went to a good home. Ah, now I know what to do with my Laurie fabrics and solids! As always, thanks for the inspiration. P.S. I actually LOVE the slight fading, and especially how crisp and fresh the fabric gets, it’s worth the fading. Oh, I love those slightly wonky postcards from the park! Too fun! 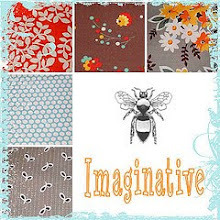 And I am so excited about Laurie’s new fabrics coming out! I love it. As usual. Laurie must be thrilled with the quilt…it’s stunning. 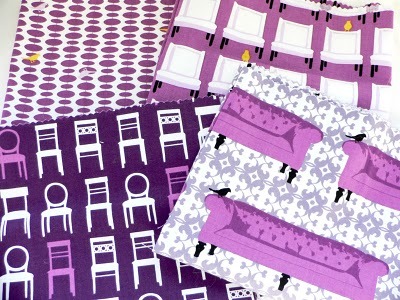 I am so happy to see those fabrics in orchid! I have some in the aqua and yellow scheme…LOVE!!! Amazing work – as usual!!! Really showcases all of the fabrics so wonderfully. Are you home safe and sound now?? I hope the rest of your trip was great! It’s really pretty and I would love to know hoe do you do the uneven sashing, or setting of the blocks? Is there a tutorial somewhere to have a closer look? I have an UFO with blocks of different sizes and this might be the solution ! Beautiful, beautiful!! I wouldn’t call myself a quilter (as of yet, trying to get there, though! 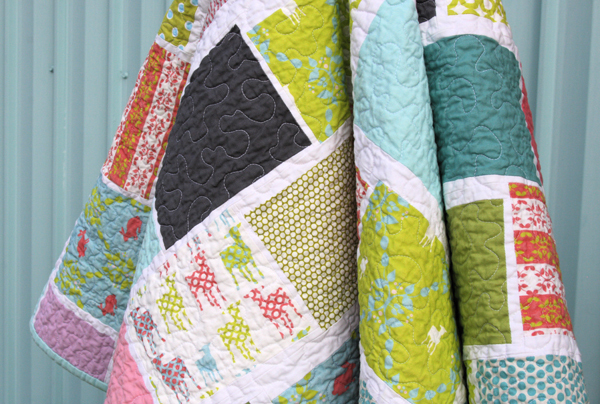 ), but I would love a tutorial on this quilt, I am simply amazed. What a fabulous quilt. I just love the blocks and the wonkiness like you said. It great. I must say, my favorite quilt changes fairly often, but today this is the one!! I love the looks of this design!!! Oooh, I absolutely love the quilt! And, as usual, love the back just as much! Getting the layout right must have taken forever, but so worth it. Laurie’s new line looks great, too! It’s great to see how you pull you inspiration from all different places. I have to put on a pair of your glasses. I absolutely love this quilt too. Please, please do a tutorial. I’ve never done wonky and I would love to do this quilt. I love the quilt desing!! Well done! I know everyone already said it but I. LOVE. THIS. QUILT!!!! Its amazing…seriously this must have taken you forever because it looks like you made each one of those little blocks individually!!?? YOu are superwoman! i agree withe Allison and everyone else… I.LOVE.THIS.QUILT!!!! here’s one more vote for a tutorial. please, pretty please! Wow. This is the greatest quilt I’ve seen! 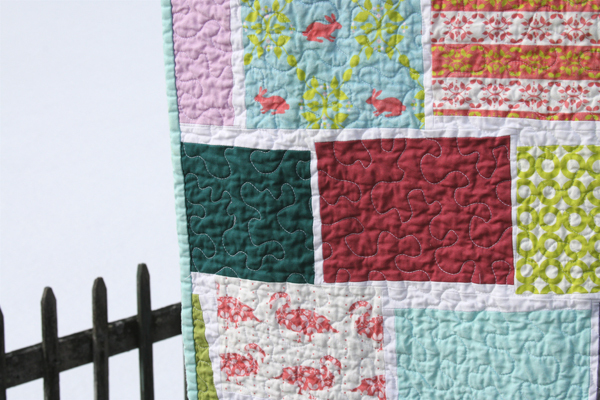 Love the colors, love the fabrics, love the pattern… love that it’s a fresh take on the idea of patchwork. I just started my first quilt, and I just found your website. I’m so happy to have a site for inspiration that really matches my style! I went out and bought fabric today after I saw this quilt. Do you have any guidelines, such as how large the coloured rectangles are before you add chop them with the white… or how large the finished block is? This is a super fun quilt! I love the fabrics… the colors are totally yum! Wow, of ALL your beautiful quilts, this one is my favorite. Just something about it. Wonderful! Thanks for posting and sharing. Blessings! I love this one! Congrats! I reallllllly love this quilt. Such yummy fabrics! I LOVE this quilt! I think I have a new favorite – thanks for sharing! this is really wonderful thank you for sharing! I’ve never done a wonky quilt, but yours has made me fall in love with the idea. Please do some sort of tutorial or offer the pattern!!!! I really want to do this quilt! this is amazing. i’m somewhat new to quilting – any tips on how to make the blocks slightly wonky like this? do you trim the actual blocks or sew them to the white rows them on when they’re still rectangles? Love the purple quilt. Simple and beautiful.